The black pigment in Guava leaves is used for textile applications. Guava leaves are used to make tea. Oils extracted from guava seeds are used in various cosmetics. Guava wood is used for decorative purposes. 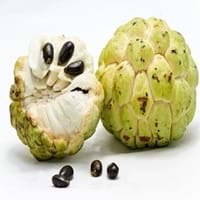 Cherimoya is also called as custard apple or chirimoya. The word cherimoya came from the Quechua word,'chirimuya',which means 'cold seeds'. The cherimoya is called as 'the tree of ice cream'. We might think that Guava and Cherimoya are similar with respect to nutritional value and health benefits. But the nutrient content of both fruits is different. Guava and Cherimoya Facts such as their taste, shape, color, and size are also distinct. The difference between Guava and Cherimoya is explained here. The amount of calories in 100 gm of fresh Guava and Cherimoya with peel is 68.00 kcal and Not Available and the amount of calories without peel is Not Available and 75.00 kcal respectively. 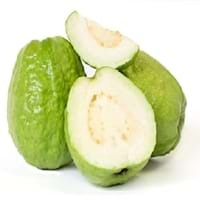 Thus, Guava and Cherimoya belong to Low Calorie Fruits and Low Calorie Fruits category.These fruits might or might not differ with respect to their scientific classification. The order of Guava and Cherimoya is Myrtales and Magnoliales respectively. Guava belongs to Myrtaceae family and Cherimoya belongs to Annonaceae family. Guava belongs to Psidium genus of Psidium guajava species and Cherimoya belongs to Annona genus of A. cherimola species. Beings plants, both fruits belong to Plantae Kingdom.